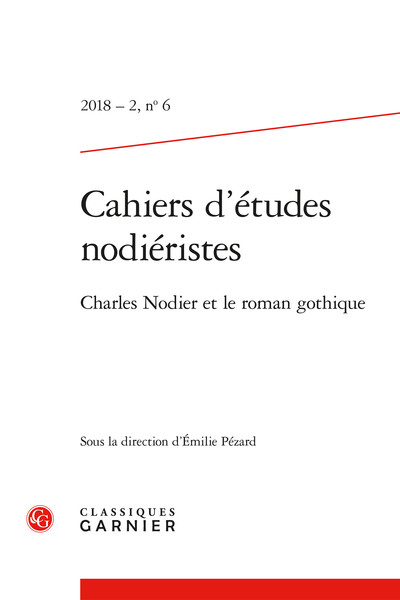 Abstract: The ambiguity of Charles ­Nodier’s relationship with the Gothic novel is particularly visible in his treatment of the novelistic space. The Italian novel Mademoiselle de Marsan (1832) ­combines an English gothic aesthetic with a historical and memorialist writing close to his Souvenirs et portraits and Souvenirs de jeunesse, thus proving that gothic can be hybridized with different novel genres. In Mademoiselle de Marsan, northern Gothic is tempered by a certain neoclassicism from the South.